If you are interested in attending UAC, have not yet registered, and would like to save some money, let us know! Every chapter member signing up once we have accumulated our official “first five” will get a 20% discount, but check with us first before you sign up to be included and eligible for the discount. 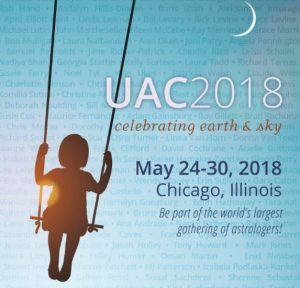 If you have already registered for UAC, please let us know this as well. We can count you as one of our first five but unfortunately the discount won’t apply retroactively for you. Thank you for setting the stage for others to save. Wishing you all the best in the midst of this eclipse season! 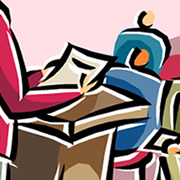 Interested in speaking at one of our meetings? NCGR Sacramento Area is accepting applications for our 2018 schedule! 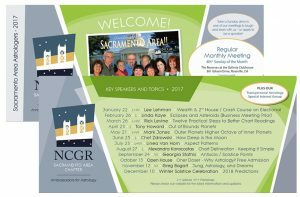 NCGR Sacramento has become a popular destination for speakers from around the world. 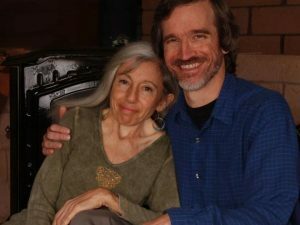 We treat our speakers as honored guests and are open to all types of topics. If you come from afar, we often coordinate with San Francisco to make your trip worthwhile. We meet on the 4th Sundays of the month (except for holidays or as noted otherwise on our schedule) and alternate between afternoon member share or guest speaker lectures and full day two-part guest speaker events (lecture in the morning, workshop in the afternoon). Our afternoon member share lectures are open to members new to presenting, so, don’t be shy. If you have something to share, please apply! If you aren’t into speaking, but you know of someone who you’d like to hear, feel free to let us know, or forward this to them directly, whichever you prefer. To apply, please fill out our 2018 Speaker Application Form. Act now as our submission deadline is September 30, 2017. The Leadership Team will then select the most relevant topics for our 2018 schedule, and will inform each applicant of the results in a timely manner, no later than the end of October. We encourage you to get involved and apply! Be a part of bringing the best astrology speakers and programs possible to NCGR-SAA in 2018. We are pleased to nnounce our speaker schedule for 2017; it’s another great one with big names and local favorites! Matching speakers with dates with topics is like putting a 3d puzzle together, and it’s always magical how it works out. NCGR Sacramento is definitely on the map as a destination for world class astrologers! NCGR Sacramento Area is accepting applications for our 2017 schedule! We meet on the 4th Sundays of the month (except for holidays) and alternate between afternoon member share lectures and full day two-part guest speaker events (lecture in the morning, workshop in the afternoon). Our afternoon member share lectures are open to members new to presenting, so, don’t be shy. If you have something to share, please apply! If you aren’t into speaking, but you know of someone who you’d like to hear, feel free to let us know, or forward this to them directly, whichever you prefer. Act now as our submission deadline is: September 21, 2016.